Bhana, N., McNaughton, D., & Light, J. (2019, January). Using Visual Scene Displays to Teach Early Literacy Skills. 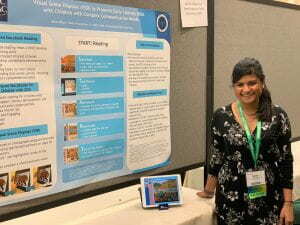 Poster at the Assistive Technology Industry Association (ATIA) Annual Conference, Orlando, FL. Abstract: In this session, participants will learn strategies to use Visual Scene Display (VSD) technology in the classroom and at home to support the literacy instruction of children with a diverse range of disabilities, particularly students with complex communication needs. Participants will learn research-based strategies that, coupled with VSD technology, will aid in facilitating shared storybook activities, vocabulary development, and sight word learning. This presentation features research by the presenter, Naima Bhana, as well as the work of Susannah Boyle, Kelsey Mandak, Janice Light, David McNaughton, Sojung Jung, Ashley McCoy, and Salena Babb (Pennsylvania State University).